Stormwater runoff is the primary cause of water quality impairment, or water quality that doesn’t meet shellfishing standards, in the Bradley and Hewletts Creek watersheds. Intense urbanization has hardened the natural landscape. Instead of soaking into the ground and being taken up by vegetation, a much larger amount of rain now quickly runs over the urban landscape and into the creeks. This stormwater runoff picks up bacteria and transports them to the creeks, causing shellfish closures and swimming advisories. The North Carolina Coastal Federation, City of Wilmington, Town of Wrightsville Beach and project partners developed a watershed restoration plan in 2007 that focuses on reducing the amount of stormwater runoff transporting bacteria and pollutants into the creeks. Partners recognize that restoring water quality in these creeks will be a long-term, multi-decade effort. The federation continues to lead a collaborative effort that is now focused on implementing the watershed restoration plan by designing and installing stormwater retrofit projects throughout the watersheds. Working with Wilmington’s Heal Our Waterways program as well as Wrightsville Beach, N.C. Department of Transportation, New Hanover Soil and Water Conservation District, UNC Wilmington and other community partners, the federation is working to reduce the volume of stormwater runoff flowing into Bradley and Hewletts Creeks. See some of our exciting progress below. This project at Waterman’s Brewing Company to replace impervious paving with pavers that soak in the rain began in the first week of May 2018. 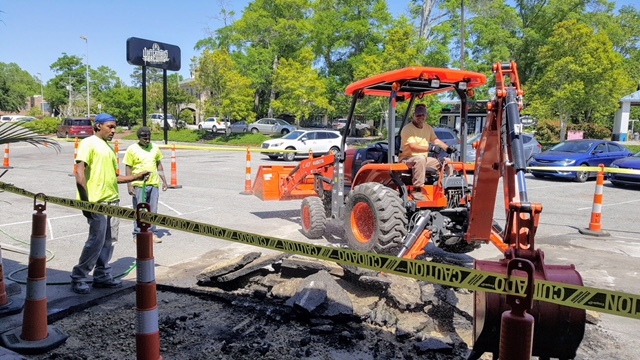 Construction is underway to install permeable pavers at the New Hanover County Arboretum and Waterman’s Brewing Company, both of which are in Wilmington. The permeable paving projects at the Arboretum and Waterman’s Brewing are funded by an EPA Section 319 grant to install a series of stormwater projects in the Bradley and Hewletts Creek watersheds. The arboretum project began early 2018 and will be complete by summer 2018. The Waterman’s Brewing project began the first week of May 2018. Permeable pavement is installed at Hanover Seaside Club. 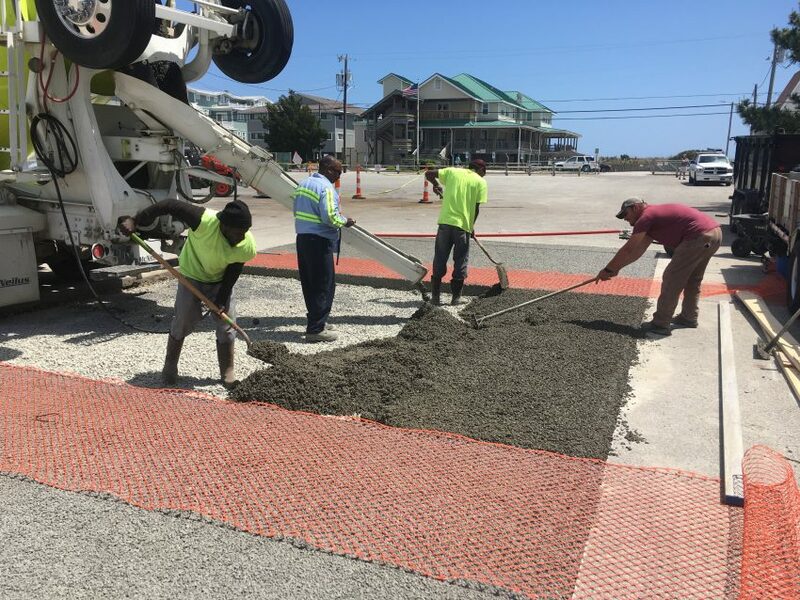 This retrofit project includes two sites where impervious paving was replaced by permeable paving at a public parking lot and at Hanover Seaside Club, both in Wrightsville Beach. These projects were funded by the N.C. Clean Water Management Trust Fund. A section of the public parking lot was replaced with permeable pavement in November 2017. The permeable pavement infiltrates polluted surface runoff from public streets and a portion of the existing parking lot. Next, multiple street and parking lot drains were disconnected from stormwater outfall pipes along Banks Channel and redirected so that runoff moving through the permeable pavement is directed to an engineered infiltration system located beneath the existing parking lot. Rather than allowing runoff to flow into Banks Channel, this system redirects runoff to soak into the ground. Working with the federation, the Blockade Runner in Wrightsville Beach disconnected two stormwater outfall pipes that discharged runoff from the 2-acre resort into Banks Channel. The outfall pipes were redirected into a series of pipes underneath the soundside lawn of the resort. This new system allows polluted runoff to infiltrate the sandy soils below. A 2,100-gallon cistern was also installed and collects rainwater for irrigation, reducing the resort’s municipal water use by around 25 percent. Tracy Skrabal, coastal scientist at the Wrightsville Beach office, accepts the Rain Catcher Award in Charleston. 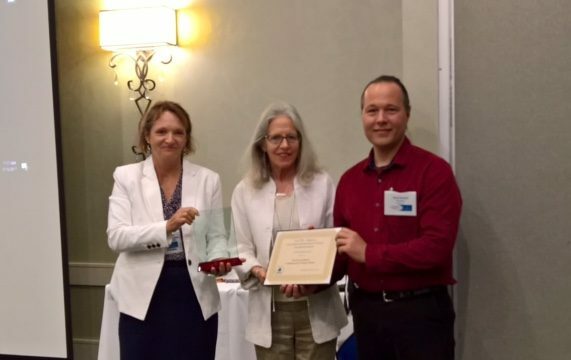 The federation, on behalf of a collaborative team, including the North Carolina National Estuarine Research Reserve (NCNERR), received a regional 2017 Rain Catcher Award from the Environmental Protection Agency (EPA) Region 4 for various innovative stormwater runoff infiltration projects in Wrightsville Beach. These include: regrading an area in front of a restaurant in order to infiltrate runoff that formerly flowed into a drain; two curb cuts that redirect 8,600 square feet of runoff into a grassy median; installation of reverse storm inlets that divert runoff into existing grassy areas to infiltrate runoff; disconnecting a street drain system into a rain garden; check dams; pervious pavement; and soundside street-end projects that redirect flow from swimming waters, including construction of an innovative perforated infiltration system/cistern design that redirects runoff from recreational waters at the Blockade Runner Beach Resort. 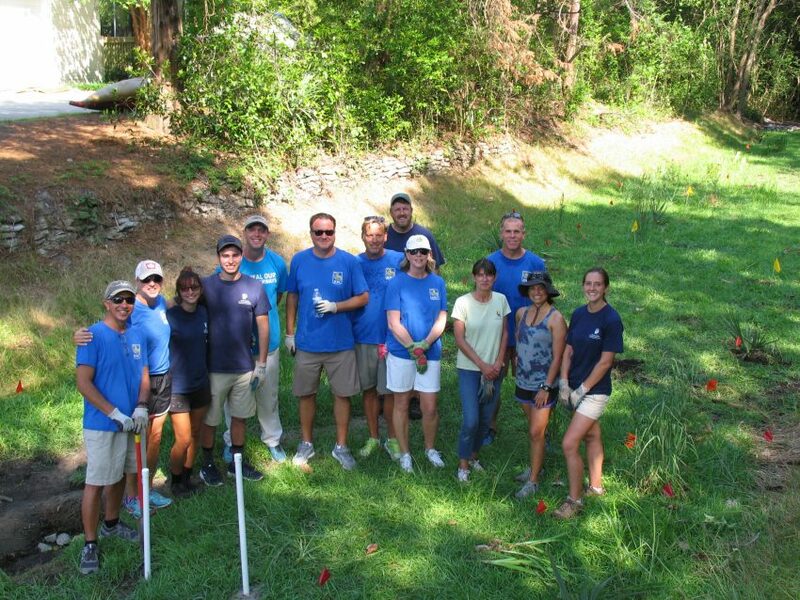 RBC Wealth Management helped the City of Wilmington and federation plant a bioretention site in Glen Meade. The 0.26-acre bioretention site collects stormwater runoff from 33 acres of homes and yards in the Glen Meade subdivision in Wilmington. A bioretention site is a basin covered with native plants, which allows stormwater runoff to soak into the ground rather than flow straight into local waterways. Five employees from RBC Wealth Management helped plant 200 native plants at the site in 2017. A stormwater ditch was converted into a meandering wetland to reduce flooding and runoff in the Raintree neighborhood in Wilmington. The wetland treats approximately 2,628 cubic feet of stormwater runoff that makes it way into Hewletts Creek, and eventually Masonboro Sound, annually. The federation secured funding from the National Estuarine Research Reserve (NCNERR) to work with firm WithersRavenel to design the project. Additionally, sections of the neighborhood streets and a series of driveways were retrofitted with porous paving to reduce the volume of runoff flowing over these once-hardened surfaces. The City of Wilmington received an award from the Lower Cape Fear Stewardship Development Coalition for this project. Existing turf areas within the Town of Wrightsville Beach are re-purposed into garden areas that feature native plantings, and capture polluted stormwater before it reaches the adjacent recreational waters. By late 2014, the construction of six stormwater reduction projects was completed in the watersheds within Wrightsville Beach. The measures were designed to be low cost, relatively simple and replicable within any town or city. The projects resulted in the capture of polluted stormwater from roads, driveways and other impervious areas. Instead of flowing directly into drains and creeks, stormwater is instead redirected away into rain gardens or grassy areas, where the pollutants are filtered out as it soaks into the ground. The projects include construction of berms to slow down the flow of runoff in existing swales, the addition of curb cuts to direct runoff to existing grassy areas, a vegetated rain garden, larger bioretention areas and installation of permeable paving. Monitoring results from UNC Wilmington indicated that most of the retrofit sites along the Wrightsville Beach Loop and Iula Street (below) resulted in a 50 percent to 90 percent reduction in stormwater volumes. A map and details about the projects are both available at walktheloop.org. Walk the Loop for Clean Water is a 1-mile, self-guided walking tour of these innovative projects. The website features a history of the project, a map of the entire trail and station-by-station information that users can scroll through on their phones while taking the tour. The lula street project disconnects street drains carrying polluted stormwater directly into Banks Channel, and allows the water to instead be held and slowly filtered into the sandy soils on the property. In November 2014, the Town of Wrightsville Beach had a metal infiltration device installed beneath the ground at the end of a pipe along Iula Street on the south end of the beach. 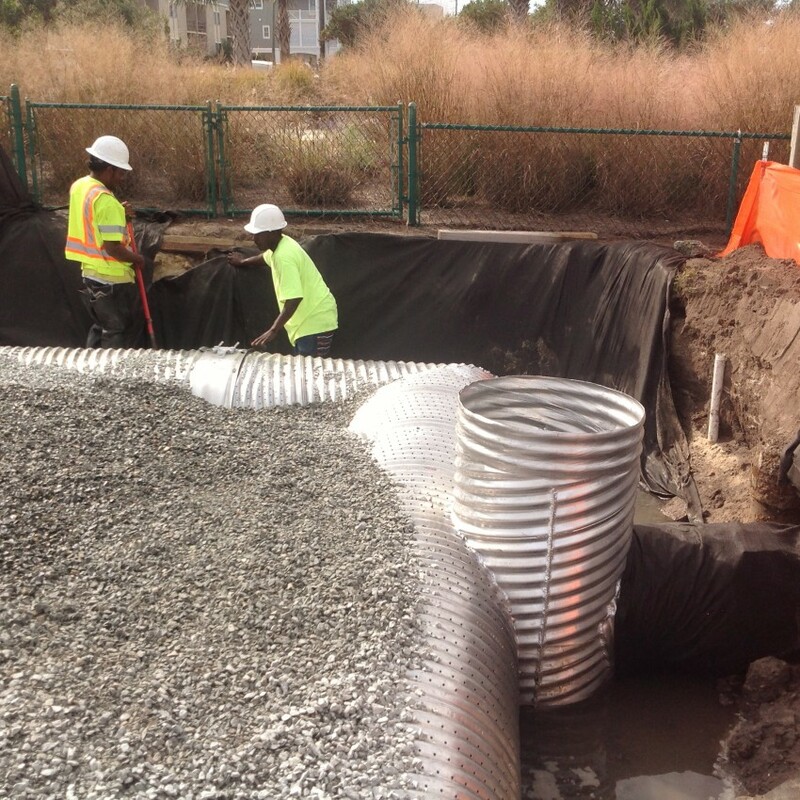 This innovative system disconnects street runoff from one of a number of stormwater outfall pipes along Waynick Avenue, and instead allows it to be stored within an infiltration chamber and slowly soak into the ground through a series of perforated pipes. Rain garden at Bradley Creek Elementary School. Construction of the Bradley Creek Elementary School rain garden began in 2010 and was completed in 2011. The federation continues to hold workdays at the rain garden, which is used as an outdoor classroom for the students. 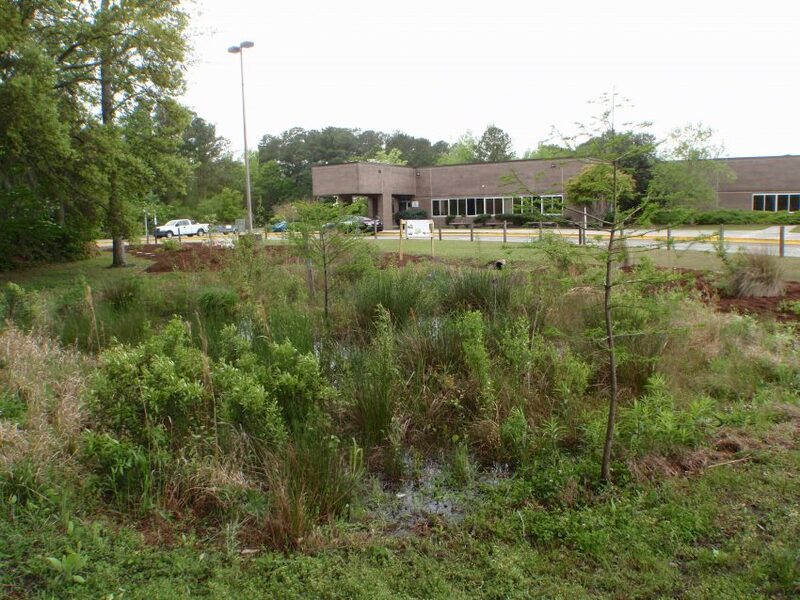 BMP #1 – This stormwater BMP is a bioretention area with two cells totaling 3,400 square feet. The project treats stormwater runoff from a portion of the school parking lot and front yard. This portion of the project was completed in May 2010. BMP #2 – This stormwater BMP is an 11,000-square-foot stormwater wetland located behind the school adjacent to the soccer field. The project area contained a shallow vegetated swale that transported sheet flow from the school’s playing fields and some of the courtyard into a boundary ditch draining to Hewletts Creek. This portion of the project was completed in November 2010. BMP #3 – This stormwater BMP is a 1,940-square-foot stormwater drought-tolerant wetland coupled with an overflow area with a raised stormwater outlet and enhanced vegetated area located in front of the school. The project area has a history of collecting a significant amount of water after rains (piped in and from sheet flow) and holds standing water for some time. This portion of the project was completed in November 2010. BMP #4 – This stormwater BMP is a 7,812-square-foot bioretention area in the grass near the main school entrance on Greenville Loop Road. The project was completed in May 2011. Construction of the Alderman Elementary School rain garden began in 2009 and was completed in 2010. The federation continues to hold workdays at the rain garden, which is used as an outdoor classroom for the students. The 2,500-square-foot rain garden/bioretention area treats stormwater runoff from a portion of the school roof, a pedestrian entrance area and walkways, a school entrance driveway and the school parking lot.